Pearl Ryan was working for New York Telephone when ITT Community Development Corp. made the pitch for retirement in Palm Coast, Florida. She watched a film, studied the brochures, and "I loved what I saw." Mrs. Ryan visited Palm Coast with her daughter in the late 1980s, bought a lot and built a house. She and husband Harry moved here in 1992, and like many Palm Coasters, many in her family have followed. Her son Weldon, his wife Richlin Burnett-Ryan and their three children visited from New York every summer after that. A police officer in some of New York City's toughest precincts, Weldon Ryan had shifted to the New York Police Department's Artist Unit, where he spent nearly 10 years drawing portraits of unidentified suspects and victims. "We fell in love with Palm Coast. It was peaceful, and the fresh air," Weldon Ryan recalled. After summer visits to their grandparents' house, "every night I'd come home, and the kids would be online looking at Palm Coast houses for sale." Weldon Ryan retired Dec. 1, 2004, after he was injured during an arrest, and his family arrived at their new home late at night on Christmas Eve. Two of his six siblings have also settled in Palm Coast, and their children, making Palm Coast home to three generations of Ryans now. Both Weldon and Richlin are very active in the local art community, and they know just about everyone in Palm Coast through art, youth football and their children's other activities, and volunteer work. What Richlin enjoys most about Palm Coast is the diversity of residents' backgrounds and the melting pot that brings them together. "The brand is 'the USA' because people are from all over. Every single nationality, as well as state, is represented here," she said. "The layers to meeting people here are so thin," Weldon Ryan added. "You really get to know people. They're family." That connection to both relatives and new friends and colleagues have made Palm Coast "home" for the Ryan family. "I like the coastal living," Pearl Ryan said. "It reminds me of my home back in Trinidad. The weather is just right – just like home." Weldon Ryan's art has always been there for him when he needed it. Ryan's mother saw a talent in him at a young age. He attended the High School of Art and Design in Manhattan, New York, and then the Fashion Institute of Technology for art. He wanted to illustrate science fiction book jackets, but it didn't work out so he pounded the pavement for freelance work. It wasn't long before Ryan turned to a different career altogether, as a New York City police officer, to get benefits and a steady income. When he was a teenager, a purse snatcher pulled his mother under a train to the tracks. It ran over her, but miraculously, she sustained only minor physical injuries. Always a protector, it stuck with him. Ryan worked the streets of some of New York's toughest precincts including Washington Heights and Harlem. He interacted with the poor, the homeless, malnourished and neglected children. Hoarders whose roach-covered walls moved when hit with light. "I saw so many de-humanizing things," he recalls. "I was a sensitive cop, but anxious. I built up walls. It was hard on me." To dig his way out, Ryan returned to art. His first painting was of his wife, Richlin Burnett-Ryan. 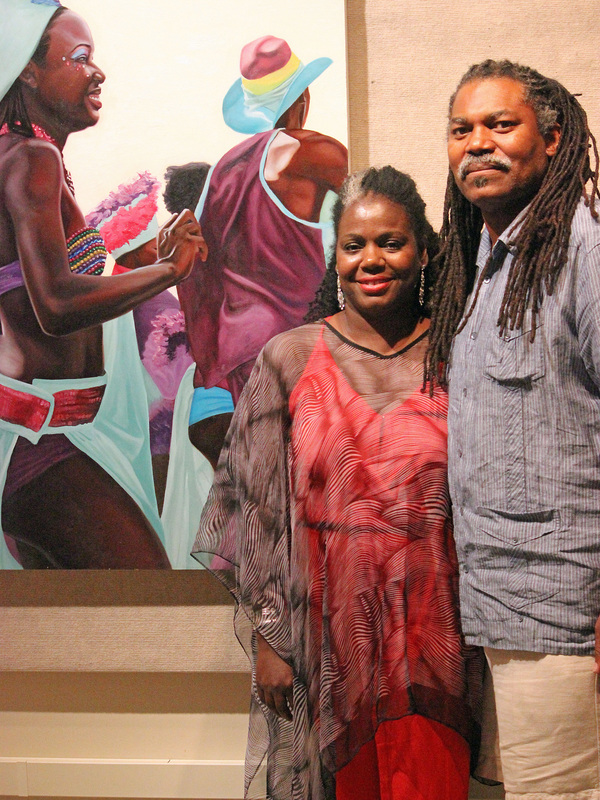 "My art has always been there for me when I needed it," he said. "Art always gets me through." 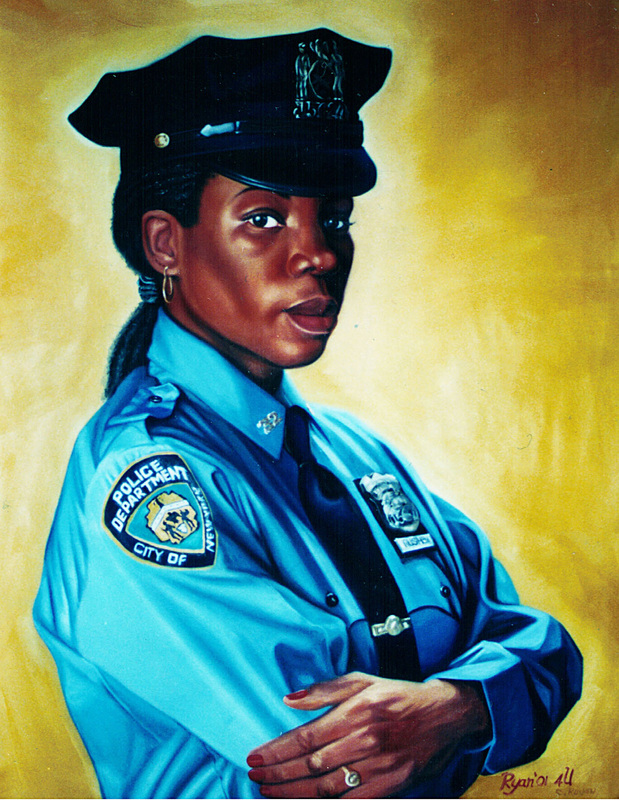 Ryan was appointed to the Artist Unit of the New York City Police Department and spent nearly 10 years doing forensic portraits. By then, his mother was already in Palm Coast. His career as a police officer was cut short when his knee was injured while making an arrest. 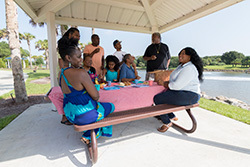 Weldon and Richlin and their three children moved to Palm Coast in 2004, and the family jumped right into the local art community. Richlin Burnett-Ryan is a gifted artist in her own right. 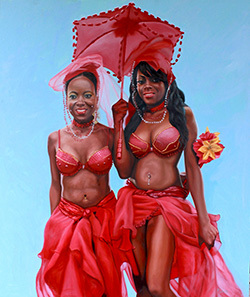 Weldon Ryan is a contemporary realist who paints portraits. He pays attention to the eyes – "the windows to the soul" – and tries to make them 3-D and wet. 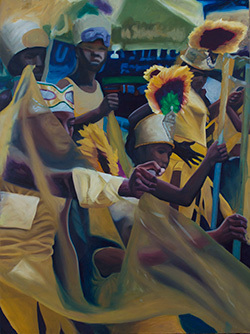 A native of Trinidad, he especially enjoys painting colorful, expressive paintings of beautiful, costumed revelers at carnival events worldwide. In 2011, he was named the Gargiulo Art Foundation's Artist of the Year. "Art to me is not only an emotional and expressive thing. It's also technique with me," he said. "I like extreme realism. My goal is to portray things in every-day natural settings." Norman Rockwell is one of Ryan's idols, and he considers himself in the same brand of Rockwell, Max Ginsburg and Gregory Manchess. "It's not just about painting a pretty picture. I also like to tell a story with my art." Palm Coast has a vibrant art community with potential for growth, Ryan said, and it plays an important role in attracting new residents and businesses. 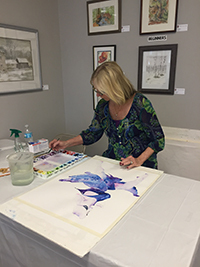 Flagler County Art League President Ann DeLucia agrees, putting art, music, theater, performing arts and poetry on par with Palm Coast's outdoor treasures in providing a good quality of life. "When you look at building a house in a community, or starting a business in a community, or raising a family in a community, the beaches, the bike trails and the parks are all beautiful and important," DeLucia said. "But you need the arts. It's the soul of a community, really." 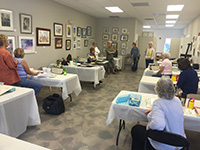 In addition to organizations and galleries including the Flagler County Art League, Salvo, the Gallery of Local Artists, the Flagler County Photography Club, and Ocean Art Gallery, there are many independent studios and talented, well-known artists in Flagler, she said. The Art League offers a full schedule of classes, and is supported through class fees and memberships. Adding to the visual arts is a community active with theater, music, the performing arts and dance – from the Flagler Auditorium and the Flagler Youth Orchestra to City Repertory Theatre and Flagler Playhouse to the Palm Coast Arts Foundation. PCAF is building the first phase of a new performing arts center in Town Center now. The Art League, located in City Marketplace shopping center, networks to include theater and poetry in its art shows. The Flagler County Chamber of Commerce supports the arts by creating a master calendar and promoting the arts through its Leadership Flagler program. 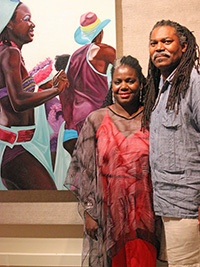 The Ryans were located at Salvo, formerly known as the Hollingsworth Gallery, for many years, and now have moved to Marvin's Garden Business Center, in Calypso Fine Arts Gallery, Unit K12, located at 4601 E. State Road 100, Bunnell. There is an artists' colony blossoming there, as well. "The art community is bustling here," Weldon Ryan said. "The one thing we need is support, financial and people. Be a fan of the artists. Buy a piece. Come to our shows. It brings people together." Looking back on the trajectory of his own life as an artist, Ryan offers this bit of wisdom for us all: "Find your art, and your art will find you." Based on our local environment, leisure services, economy, education, health, demography, crime, housing and infrastructure, 24/7 Wall Street Journal has ranked Palm Coast as the 39th most livable city in the United States! The online news source gives Palm Coast's housing and economy especially high marks. Moving from staggeringly poor figures in 2008 to startling high growth numbers in 2015, City leaders and residents can be proud that people all across our nation are taking a second look at our hometown. Much of this success can be attributed to City Council's Prosperity 2021 vision to grow the local economy. That plan directs attention to updating infrastructure, beautifying neighborhoods, attracting sports tourism and providing responsive code enforcement. Council also established a Business Assistance Center, partnering with the University of Central Florida's Small Business Development Center, to equip local businesses with resources to build a strong, reliable customer base. 24/7 Wall Street Journal's recognition of Palm Coast's livability is also the result of Prosperity 2021's strategy to develop an attractive city that values quality of life. Palm Coast has constructed 125+ miles of hiking/biking trails. We've preserved acres of conservation areas for unparalleled peace and built new parks for recreation. We've upgraded drainage, widened roads and welcomed unique sports tournaments. We value a cleaner environment, providing expansive recycling and household hazardous waste collection. Our City's efforts symbolize the sustainability and beauty of Palm Coast as an enviable community where people are proud to live. People are now moving here from more places and are showing more interest in our City. Instead of others asking us, "Where is Palm Coast?" 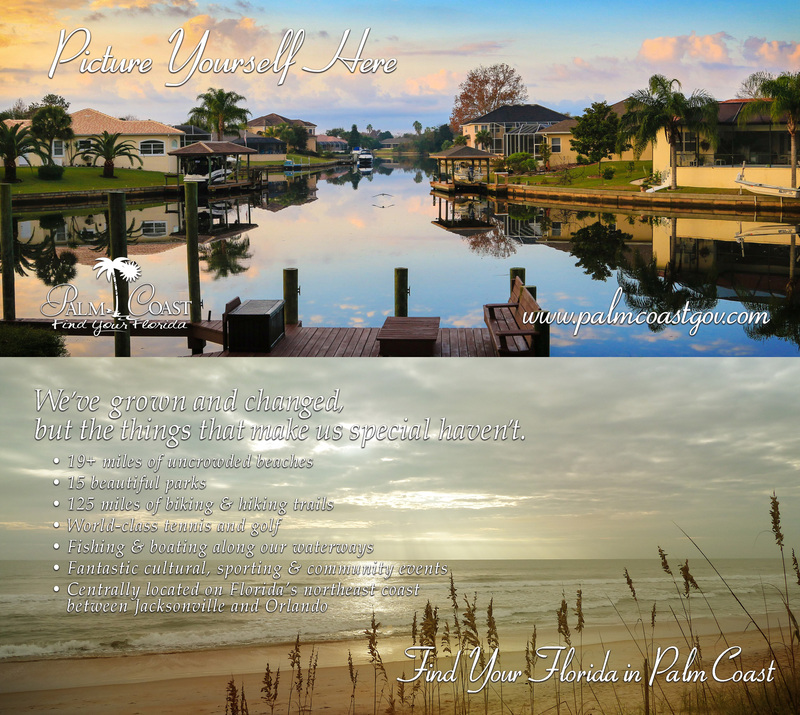 they're now saying, "You're lucky - you live in Palm Coast!" The doors at 160 Lake Avenue officially opened in our downtown Town Center in 2015, ushering in a new era in Palm Coast. 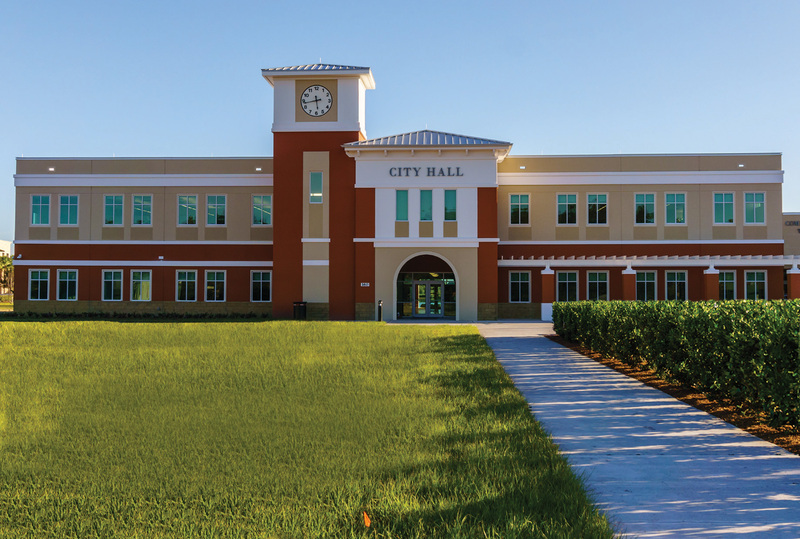 Our first permanent City Hall built for the sole purpose of serving the public was unveiled at a Grand Opening on November 3, symbolizing 16 years of triumphs and struggles that Palm Coast experienced over the short 16 years since its incorporation. 2015 became the year City Hall authenticated our identity as a hub of energy where our citizens can see their elected officials in action, receive services from the City, and where expanded commercial and social activities are stimulated. 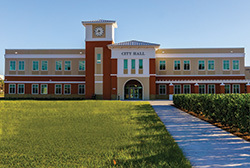 Since 1999, when Palm Coast incorporated as an official Florida municipality, City offices were housed in five temporary locations: the Palm Coast Community Center, the former Flagler County Library (when it was located in the former Palm Harbor Shopping Center), One Corporate Drive (former ITT headquarters), 2 Commerce Boulevard and City Marketplace Shopping Center on Cypress Point Parkway. 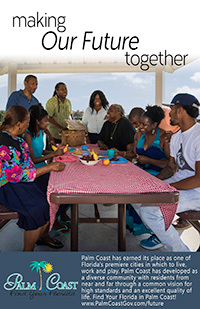 In 2015, City Hall rapidly became recognized as the full-service, one-stop facility where residents can complete all their city-related business. Employees merged their offices from other locations and moved to these departments at 160 Lake Avenue: the Business Assistance Center, Business Tax Receipts, Customer Service, Code Enforcement, Building, Zoning, Permitting and Planning, Finance, Administration, IT and Construction Management & Engineering. A Community Wing on the west side of the office building houses the City Council Chambers, a large community meeting room and two smaller rooms that will eventually be available to the public to rent for their events. City Hall is our investment in future economic growth of Town Center, an area created as a core for expanding development. Bringing the new City facility to the downtown area enhances opportunities to attract prospering business and jobs to Town Center, establishing the City as among the early stakeholders to signify this location as an inviting place to live, work and play. This year's opening of City Hall will most certainly be remembered as the historic year Palm Coast re-defined our community as a small town with a very big presence. 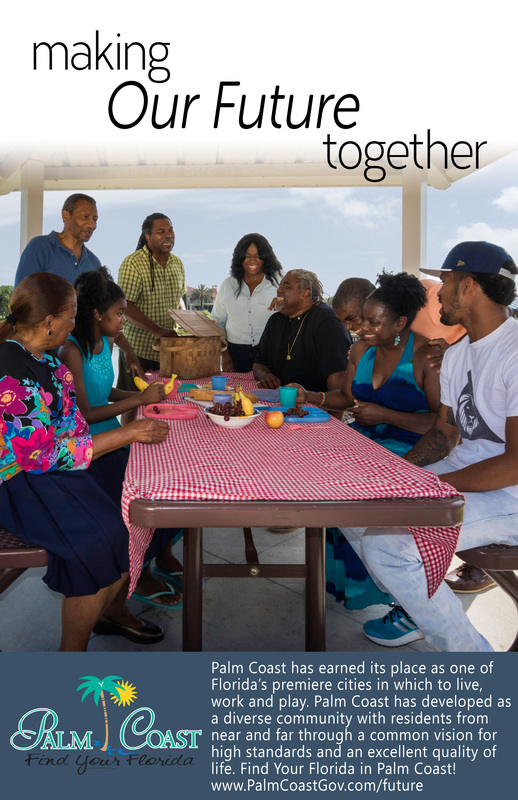 The year initiated our journey to unite residents in tradition, diversity and community spirit at a permanent gathering place – their very own new City Hall.